I swear I missed these delicious soft sweet brioche like buns when I went to Rome. I didn’t see them or perhaps my tunnel of vision at that time was just on gelato, all different flavours. But then we were too busy taking in all the sights and hardly had any time to laze around cafes and coffee shops. Gelato, prosecco, pizzas and pasta were the main things I looked out for. The only time I had anything sweet besides gelato was tiramisu. Oh well anyway, baking these soft, sweet, orangey buns was a delight. Obviously the whole house smelt so good and the buns disappeared pretty fast during breakfast. When I baked the maritozzi, I was in Montreal. I had to shop for all the ingredients including the yeast as my son does not bake at all. So there I was standing in front of a huge choice of different types of fresh cream. I was so confused, I first picked up the double cream and put it back on the shelf thinking I rather choose a lighter one. So thinking that country style would mean a lighter cream, I bought that. After baking and cooling the buns, I tried whipping the cream and it just did not whip! So we had the buns without any fresh cream. I just toasted them lightly and we had them with butter. Had to make a few changes as my son is not a huge fan of raisins and pine nuts. I added dried cranberries and almonds instead. I will try the original recipe with raisins, pine nuts and cream soon. 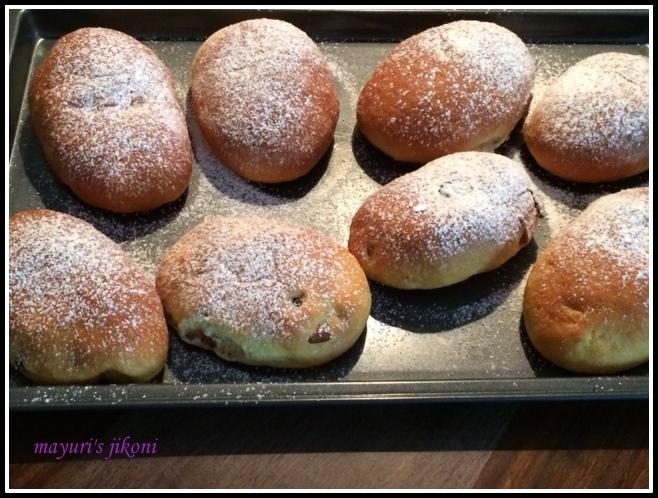 Maritozzi (singular maritozza) comes from the word marito (husband). It is believed that the unmarried women in Lazio baked these sweet pastry and brought it to the village piazzo hoping to attract the attention of their future husband. Others claim that it was actually the men who gave these sweet cream filled buns in the shape of a heart to their fiancée. What ever the reason, sharing these buns with loved ones is heartwarming. Prepare the sponge, starter or biga first. To do that, using a spoon mix ½ cup flour (from the measured amount), 1 tsp sugar, warm milk and yeast in a big bowl. Cover it with a cling film and leave it in a warm place for 30 minutes. In the meantime soak the raisins or cranberries in the warm orange juice for 10 mins. Prepare the glaze if you are using it. Boil the sugar and juice or water over low heat till the sugar melts. Keep the glaze on the side till required. After 30 minutes, add remaining flour, egg, sugar, salt, the remaining liquid from the soaked raisins, orange zest and vanilla extract to the starter or biga. Dust the worktop with flour and turn out the dough from the bowl. Knead the dough using butter little by little till you get a smooth and elastic dough or for 10 -15 minutes.If the dough sticks too much dust a little bit more flour but not too much. Add the soaked raisins and nuts to the dough and knead it into the dough. Shape the dough into a round shape and place it in the greased bowl. Cover with a cling film and place the bowl in a warm place. Let the dough rise till it is double the size or for 1- 1½ hrs. Knock down the dough gently and divide it into 8 parts. Let the pieces rest for 10 minutes. Take one part of the dough. Roll it in a round flat disc about 3-4 inches in diameter. Roll up the circle into a swiss roll. Pinch the seams. Tuck in the ends. Place the oval shaped dough on the greased tray. Repeat steps 12 -14 with the remaining dough. Cover the tray with a tea cloth and let the buns rise for 30 – 45 minutes. Place the tray with the buns in the oven to bake for 15 -20 minutes or until they are light golden in colour. Don’t over bake them as they will burn from the bottom. Remove the buns from the oven and brush them with the syrup if you are going to use it. Otherwise, let the buns cool on a wire rack. Whip the fresh cream with powdered sugar till it is just stiff. Slit each bun from the top or the side in the middle and leaving the sides intact. Fill it with the cream carefully. Make sure the buns do not split apart. Using a spoon or palette knife smooth out the cream.Dust with powdered sugar and serve with coffee. You can add candied orange peel if you like. I used cranberries instead of raisins and almonds instead of pine nuts. They taste good when toasted lightly and buttered. Keep the buns in an airtight container so that they remain soft. Using butter as you knead the dough makes it less sticky and easier to work with. These were awesome.. I made and enjoyed them too. Mayuri – I always like to read about all the interesting anecdotes you include in your blog post. I was picturing all these pretty unmarried ladies of Lazio bringing this sweet pastry to the village piazzo to hoping to find a husband. Hats off to you for managing to cook them in your son's kitchen. The maritozzis look delicious. you absolutely right Shobha, they were delicious. Planning to bake some again very soon.